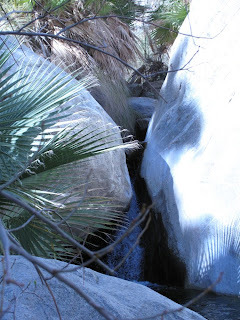 On Thursday before leaving Anza-Borrego I decided to hike the Palm Canyon Trail. The trailhead was about .7 of a mile from our RV. The hike itself is 3 miles round trip. 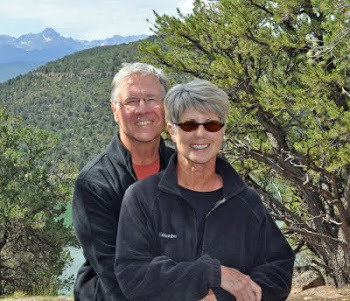 Most of my hiking has been in the mountains of Colorado and Montana. So, I was not sure what to expect from a desert hike. Besides the sign warning of snakes and mountain lions there was a sign warning that the trail was hot and dry and to be sure and carry plenty of water. Not to worry, I had my camelback. Besides water I also had some snacks, cell phone and my emergency kit. Regardless, of how far I hike I always carry a small stuff sack filled with my emergency supplies. My kit includes, nylon cord, compass, Swiss Army knife, lighter and waterproof matches, mirror, small first aid kit, whistle, emergency blanket, and a candle. This seems to be a popular hike. I found the varied terrain to one of the best things about this hike and palm oasis at the end was well worth the trek. The first part of the hike was a dry, hot, and barren trail over coarse sand. About a quarter of the way in, you approach a cliff side – a wall of boulders. This was the first shift in terrain. About half way into the hike the landscape changes again. This time the scenery turned green. In fact, I crossed a small creek on a palm-trunk footbridge. Finding flowing water in the desert was a surprise to me. The last section of the trail was the most challenging requiring some scrambling over rocks and crossing the creek a couple of times. By this time I could see the palm oasis in the distance. At the end, I entered the Palm Oasis made up of a stand of California Fan Palms. There was even a small waterfall – all very cool (both figuratively an literally). I sat, had a snack and then headed back. Instead of taking the same trail back I found a sign for the “alternate” trail. This is probably a bit longer and climbs up and over that wall/boulder field I encountered on the way in. If you are looking for a short moderate hike – this will fit the bill. I want to go too! I like hikes like that, a nice reward at the far point. That's why I love hiking to waterfalls. Yes - a very enjoyable hike. Thank you for the report. I have hiked that trail and find it very much as you describe. A pleasant trek in the desert, yes there is water in the desert, just not often or a lot. Thanks Paul. We are currently in McDowell Mountain Regional Park (East of Phoenix) and interestingly enough we got a pretty good rain last night. The desert here is really greening up.